October 13, 1990: At ten o'clock on an overcast Saturday morning, I sit alone on the tailgate of the truck on the road to Fern Cave, waiting. Why is it, I wonder, that everything in my past, be it pain or pleasure, tends to be so colored with nostalgia that the memory itself becomes untrustworthy? Was that really me, so many years ago? Fern Cave, with its looming pits and fifteen miles of overlaid passages: a sanctuary I have visited several dozens of times before, its twisting canyons pressed so deeply into my memory that I can close my eyes and see them. 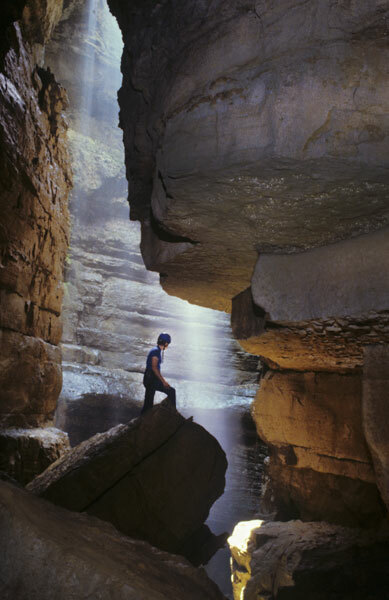 I think of water cascading over flowstone at the Bolt Drop; I see the dark, looming void of Surprise Pit. 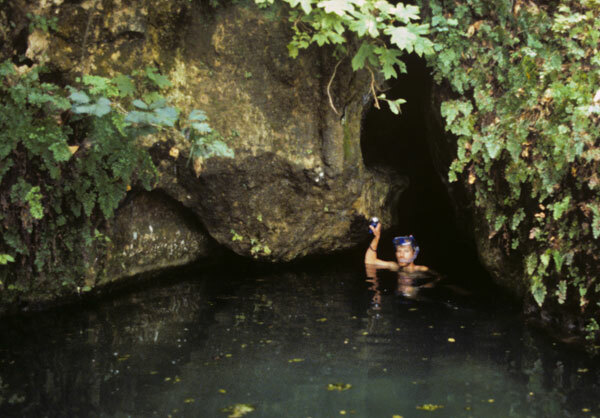 When I dream about caves, inevitably I dream of Fern. Can it have been fifteen years or more since I first set foot there? I remember Randall Blackwood's old car sailing sideways through mudholes with Journey to the Centre of the Earth thundering on the eight track, how it felt to move confidently through the woods as a teenager, without worrying about bad knees or how much to pay on the VISA bill. For years Randall and his brother Harold organized an annual photo trip to Surprise Pit, and I'd always been glad to help. So I think and sit and wait. Other cars arrive and we start off for the cave, nine of us: Randall and Harold and Steve, Tom Moss, Ed Kilgore, Rick O'Hara, others. As we hike up the mountain the question which has haunted my caving trips of late (why am I here?) is happily absent from my mind. I have been cooped up indoors for a week and I'm eager to breathe fresh air, to feel the muscles working in my legs. I stupidly leave my wheat lamp in the truck and have to sprint down half the mountain to get it, but I feel strong. 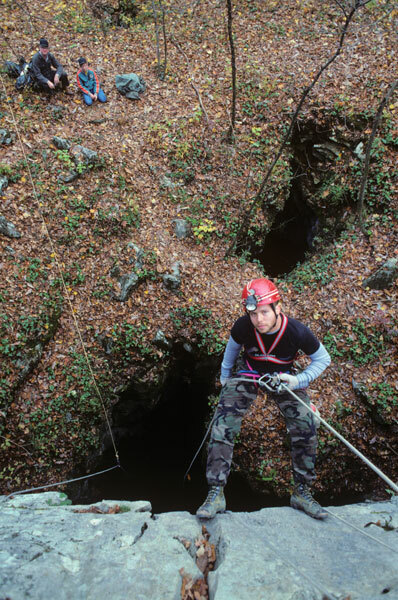 I catch up at the sinkhole before the last of the group enters the cave. I slide down the cool rocks, the ammo can containing the Nikon banging gently against the wall, and then I'm inside, moving quickly down the 500 feet of walking passage to Surprise Pit. 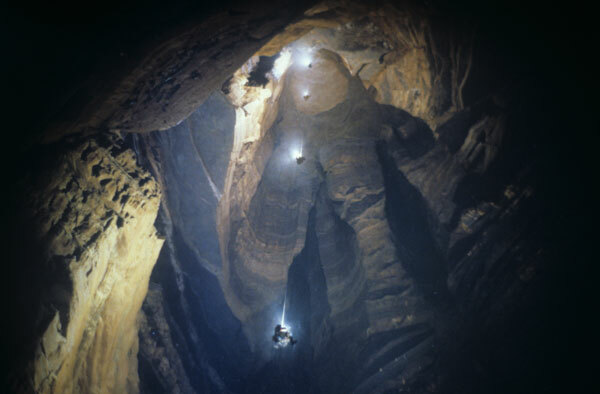 The legends are all still fresh in my mind--how in 1961 a young Bill Torode had stopped to eat a sandwich while others entered the cave, unwittingly taken a shorter route and gotten ahead of the others to discover what was for many years the deepest shaft in America--but my own legends are equally vivid. I remember how we crept down this passage for our very first time, gauging the sounds of water ahead, watching every footstep as if a 400 foot shaft might appear without warning beneath us. I remember lying on my belly at the edge of the void, the wide beam of my carbide lamp trailing off into nothingness below me. We move cautiously across the narrow ledge to the breakdown bridge, aware always of the area of darkness just to our right. Torode dug these human highways, a whole series of them around the pit, some easy and some frightening, and the word "Torosion" was invented. 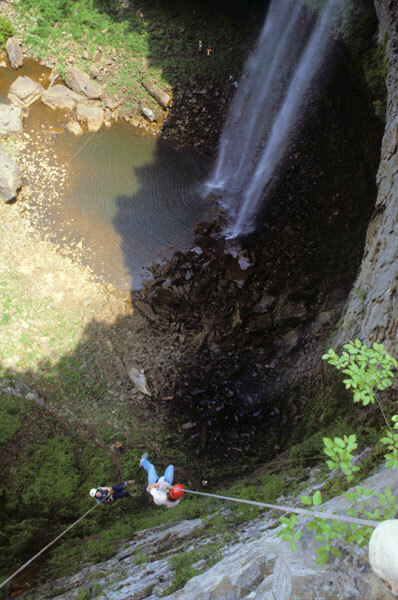 A safety rope is put across, and Ed Kilgore and I bring over the duffel containing the 650 foot rope. I use this rope to rig the 404 foot drop while Randall distributes flashbulbs and goes over the complicated plans for the photography. Harold will be on bottom with his large format camera. Ed and Luther will spread out on the huge floor of the pit with flashbulbs; Ed will have a couple of cameras as well. Tom will flash from the rope. I will be 250 feet down on the Torode Hall ledge with my camera, and Rick will flash from the rope rigged to get me there. Four radio headsets will provide communications. Randall, Rick and I go across another ledge to reach the 352 foot rig point which leads to Torode Hall. There is no safety rope on this ledge, but there is just one bad spot where bare rock slopes steeply into the pit. Someone has been digging it out a little wider, which doesn't help at all. Some of the others look the spot over and declare they will stay on the bridge, while Randall and Steve scamper back and forth without a thought. I have crossed this ledge a dozen times or more; I am confident but a little curious. If I did this in the past, am I more foolish or wiser now, stronger or more feeble? Have I gained or lost? It's impossible to know, so I test myself, like the night I sat alone in a graveyard to see if it would scare me. Like a decade before, when I hiked up alone to this very pit, tied two ropes together so they would reach, and stood on the bottom in the darkness...but all of that becomes irrelevant now, a romanticized episode of an unreliable past. The only way to be sure in the present is to test, and retest. We rig the 352 foot drop with a 300 foot rope tied off at the lip. It won't reach the bottom, but that's okay, since I'm not going to the bottom. I rig in to descend. The wall is close for the first 150 feet, then all at once the wall is gone and I break out into sudden, breathless space. Below me I can see Harold and his assistants setting up. Above, a Coleman lantern lends a warm glow to the top of the pit. I swing onto the muddy, sloping ledge, tie the rope carefully off, then carry my camera and tripod here and there, looking for the best angle. The photography is slow and confusing. Shutters continuously open, we cover our lenses while those on rope descend in fifty foot intervals to light particular sections of the pit. Radios work intermittently. Bulbs refuse to fire. Shouted questions echo across the pit. We try again, Tom and Rick climbing to flash. Rick comes down to fire a bulb from my ledge, and I put on a starburst filter to capture the moment. 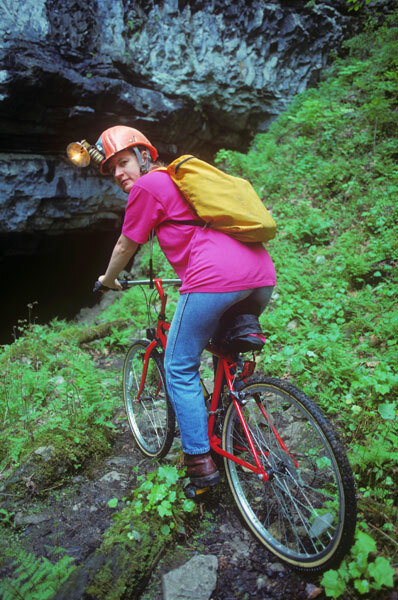 Rick would die of cancer just a couple of years later, disappear right off of this earth, but I remember him from that day as a strong caver who worked hard for the success of the whole team. I'm ashamed now to say I didn't know him better, can't even recall his face. But I still have that picture of a distant figure standing in the darkness, holding that starbursted bare bulb high over his head like a trophy. Before departing I take a quick trip into Torode Hall, the huge passage that is the sole reason why anyone would normally want to come down to this muddy ledge. The passage, like so many of the signficant features of this cave, was explored by Bill Torode and is a worthy tribute to his name. 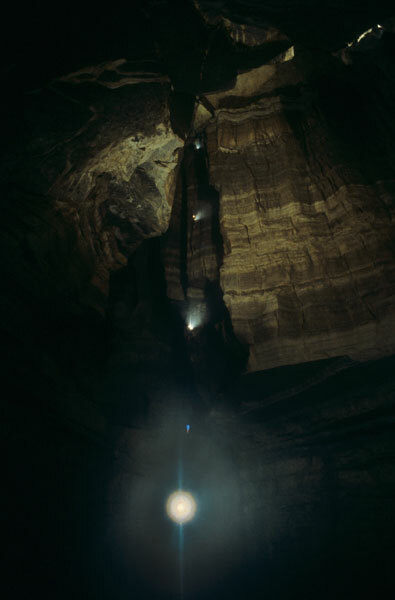 The route stays 150 feet above the actual floor of the canyon, soaring at least as high overhead in many places. You stick to one wall or the other, following a tiny trail over breakdown that often slopes into oblivion. The right-hand side was scary enough at one point that I backtracked so I could try to the left. The canyon ends in a nice upper formation room, including one dome with leaves from the surface stuck to the flowstone. A bolt there, probably placed by Torode, shows that this lead has indeed been checked. Back at the pit, my climb is slow and hot. I am imagining the ammo can spilling open, the Nikon disappearing beneath me. Randall and Steve derig my rope and slip back across the ledge to the breakdown bridge; I follow with my pack and photo gear. The bad spot is suddenly worse than I remember, and I can't quite figure how to cross it. Coming in, I had simply stepped up on a couple of key footholds, my back to the pit, but from this direction it is necessary to swing my legs around and step down at an awkward angle, looking all the while into the face of doom, that short slope that leads into nothing. I put one leg down but the foothold is just out of reach. Sweat runs down my forehead. I shift positions and try again. This time my foot reaches easily. On the bridge, Randall is lying on his belly on the very edge of the pit, his body sloping ominously downward, watching Harold on the rope. I go over and stand by him, ready to grab his feet. Over the years, I have had nightmares about friends falling down pits as I watch helplessly. I don't think I'm dreaming now, but it doesn't hurt to be sure. A year or so later, I would circumnavigate the entire pit on the ledges that Torode dug--there is one point where you must go head-first down onto a narrow dug ledge that seems to be no more than a foot wide--and I still occasionally lie awake at night thinking about that spot. I'm not so tough as I would believe. Would I do it again today? Probably not. It is late and everyone is tired. "In the immortal words of Bill Hansen," Tom intones, "I hurt, therefore I am." Ropes and packs and muddy bodies are pushed out the entrance. The sky has cleared and filled with stars. We stand marveling at pinpricks of light which have traveled thousands of years to reach our eyes, looking directly into the past as if through a time machine. Just as I have gone back to Fern Cave to test its romance, to confirm my own past, returning compulsively to a place that is timeless to try to confirm that I haven't changed, either.